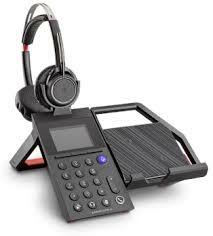 The Poly (Plantronics) Elara 60 Series is an on-desk solution for enhanced smartphone collaboration designed for the mobile-first professional. The Poly Elara 60 forms a key component of VideoCentric’s Desktop solutions for organisations using Microsoft Teams. For businesses who actively encourage mobile workers, the Poly Elara 60 enables a seamless transition between the mobile phone and the desktop, providing a headset, speakerphone and handset option once you arrive at the desk without hanging up the call. Use the Elara Microsoft Teams button to launch Teams on the mobile phone to manage audio, video, chat, or web conferences. By leveraging the power of teamwork, you can communicate your way — seamlessly. Use the Poly Elara 60 Series app to customise settings and keep the device updated. And by subscribing to Poly Manager Pro software-as-a-service via VideoCentric, you gain valuable insight into device usage, inventory tracking and firmware updates across your business.